- From the tea garden to the tea cup. - Attractive profit with 1-year tea contract. Exceeding the expectations of guests is essential. 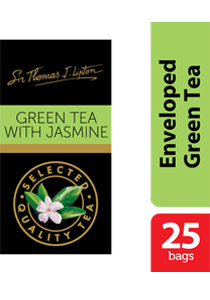 Impress your guests with Sir Thomas Lipton teas, exclusively selected from the world's renowned tea regions. 100% Green Tea with jasmine flowers. Place one tea bag for each person in a cup or pot. Pour in hot water. Allow to infuse for 2-3 minutes.